The theme of the Children’s Summer Reading Program this summer is Libraries Rock. 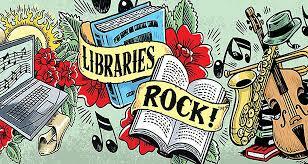 Certainly many of the adults at the library have grown up with rock music whether it was Elvis Presley, the Beatles, Backstreet Boys or Led Zeppelin. That may be why there are many biographies of rock musicians at our library and in the system. Maybe your favorite musician is among them. Mine is. My husband and I fell in love to Fleetwood Mac. On Thursday, July 12, at 6:30 pm, we will be having a program on Led Zeppelin and the early rock influences on that band. If you have some favorite memories of a rock concert you went to, please share them with us. We will be making a display in the downstairs gallery.